Electronic Arts’ next big role play endeavor, Kingdom of Amalur: Reckoning will be receiving three different special editions the publisher announced this afternoon. 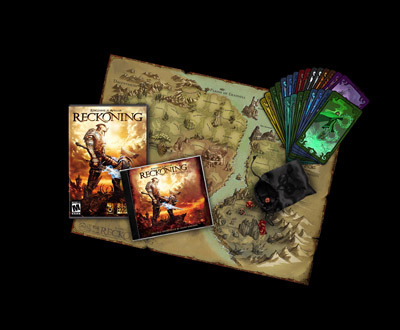 For $80 you’ll receive a seven piece set of dice, a set of 40 collectable cards, a world map (similar to the ones that Bethesda packs in with The Elder Scrolls series), a limited edition lithograph and in game downloadable content. Only have been 2000 produced. If your money is really burning a hole in your pocket, then the $275 signature edition might be your thing. It includes all of the above goodies as well as a custom sketch by McFarlane and the statue is signed by McFarlane, Curt Schilling and R.A Salvatore. The Signature edition will be limited to the first 300 orders. There’s a lot of stuff included in the special edition considering it is only $20 more than the asking price of the game. The statue alone makes makes the collector’s edition worth it , in my opinion. What do you think?